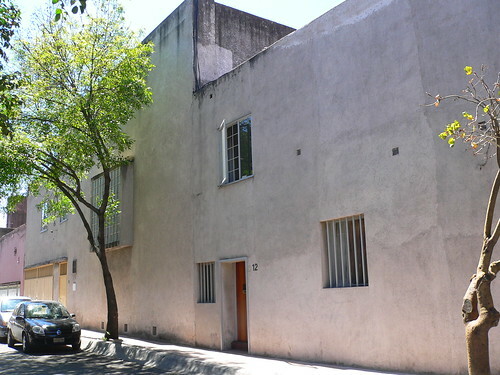 This is the Mexico City house and studio of Luis Barragán, considered by many to be the foremost Mexican architect of the 20th century. Built in 1948, the house was listed as a UNESCO World Heritage site in 2004 and is now a museum. We weren’t allowed to take photographs, which is unfortunate because the photos provided by the museum’s website give an inadequate and even somewhat false impression of the house’s quite amazing interior. Typical features of Barragán houses have been well-documented elsewhere – see here or here for more information. In short, Barragán is known for using strong colours that held an elemental symbolism for him – sunlight, earth – and in addition he often followed the Mexican tradition of painting walls pink. Blue and green weren’t used indoors because Barragán, also a landscape and garden designer, preferred to allow large windows to admit views of foliage and sky. Few minimalist architects use a palette this vibrant. Barragán used wood liberally, and he often used it in heavy slabs in a sort of minimal version of traditional Mexican woodwork. He worked out room proportions mathematically, and he did this independently for each room, so that even door size is not standard throughout the house. And you can feel this in the changing mood from room to room. Barragán won the Pritzker Prize in 1980, making him only its second winner. Below (via Steve on Flickr), the house’s exterior is deliberately modest and unassuming, as is the neighbourhood. The famous stairs are cantilevered, as you can see in the photo of Luis Barragán below. The planks are embedded 30 cm into what is the thickest wall in the house. Many of the tables and benches in the house are similarly cantilevered via embedding in the walls. To my surprise, Barragán turns out to have been devoutly Catholic and many details in the house reflect this. He was reputed to be gay, so I assumed, wrongly, that he would have turned his back on the Catholic church. Perhaps the house was in some ways his own private chapel, free from outside interference. Religious elements are everywhere: the famous lightwell illuminating the statue of an angel, the crucifixes, the articulated window shutters which when closed produce the symbol of the cross. And then there’s the odd pyramidal object on a pedestal leg in the estancia; it’s a magazine rack based on an altar stand. In spite of my extreme irreligiousness I liked it. But as for crucifixes, personally I’d rather not see graphic, aestheticized and institutionalized images of torture in a house, especially over a bed. Everywhere you turn there are also large reflective mirror balls. Reportedly these allowed Barragán to see everyone in the room at once. The house’s religiosity and the inverse panopticon effect of the mirrors give the house a strange forbidding monasticism, and yet despite all the piousness and paranoia it’s still a strangely welcoming place. Not everyone thinks it was worthy of WHS designation, considering that no Corbusier or Frank Lloyd Wright house is designated. I’m not qualified to weigh in on that, not knowing enough about Barragán’s influence or about WHS, but I think it’s a house worth protecting. You might have to go see it for yourself (appointment necessary) to understand why. See the Barragán Foundation here. This entry was posted on Sunday, May 16th, 2010 at 7:53 pm	and is filed under architect, architecture, art, design, favourite, furniture. You can follow any responses to this entry through the RSS 2.0 feed. You can leave a response, or trackback from your own site. this series on mexico city is really, really awesome. thanks so much for sharing some unique images (images that otherwise i personally would never have seen). this house is beautiful. thank you for this introduction and posting. yellow and pink, and those stairs. truly inspired living. as always, love coming to your blog..
ditto the above comments, these are really wonderful entries. Well, thank you very much everyone. I felt Mexico City’s design history has been under-publicized, especially when it shows up much of the rest of North America. Also, considering the prevalent attitude toward Mexicans that seems to be prevailing in Arizona and elsewhere (including Canada where Mexicans are now required to get a visa), I thought it was worth tipping the scales a bit. Not that Arizona is reading this blog! Well, maybe some people in Arizona are reading it… perhaps in Taliesin or Arcosanti at least. Of course! But when I say “Arizona” I mean the … well, less enlightened side of Arizona. I love the pink door and stairs — this is such an interesting post — I appreciate each and every time I come to your eclectic sight. And the last shot of the pink wall and blue sky is remarkable!